Not having heard this band in it's day is a treat for this fan of Heavy music. This is so well played out musically vocals & music alike are seamless and worthy of this re-issue. 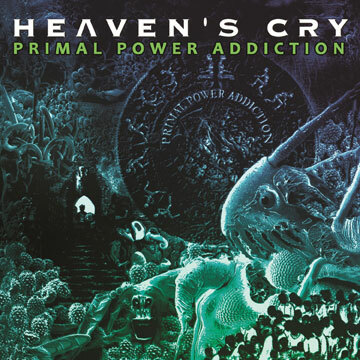 HEAVEN'S CRY formed in the early '90s in Montreal. Before long, founding members St-Jean and Sylvain Auclair (vocals, bass) signed with Canadian label Hypnotic Records and recorded their debut album "Food For Thought Substitute" in 1996. The album was simultaneously released in Japan and was awarded the #13 spot for "Metal Albums of 1996" in Burrn! Magazine. Subsequently, the band's buzz spread throughout Europe and earned the band several "album of the month" features in many acclaimed magazines. For a real appreciation for how developed and bigger than what can be explained here check out the video below. This album is so full of such songs that do more than give you an incredible amount of musical prowess from all involved. Prowess is a superior skill or ability. This will be an incredible year for music this is album review #2 and I have yet another of their albums to review that also comes out today.